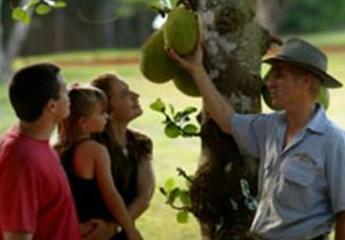 With Mareeba as the hub of The Savannah Tablelands Food Trail, it’s a scenic drive from Cairns up the Kuranda range to start your tour. 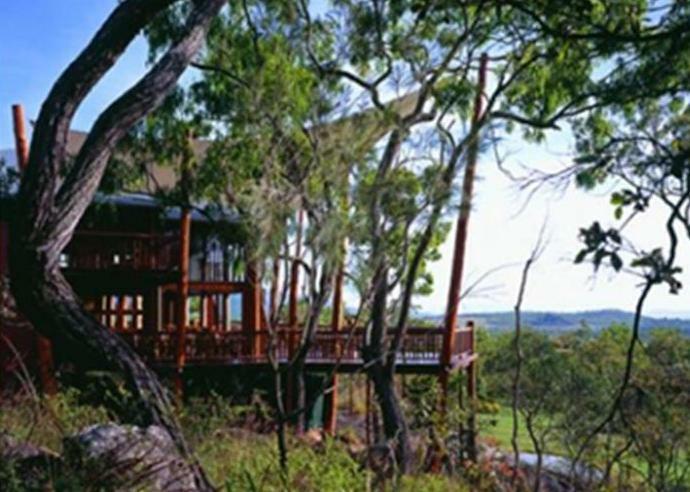 Mareeba is the gateway to the outback and The Savannah Way in the west on the Dimbulah Road where the landscape changes to granite outcrops. The food trail covers the area south of Mareeba on the Kennedy Hwy from Walkamin (start of the Mountain Tableland Food Trail), Travelling north through Mareeba to as far as the Wetlands Centre. You can continuing on to Mt Molloy and Jullaten to access Cooktown and Cape Yorke Peninsula in the north or take the mountain pass road to Mossman and Port Douglas to the east. The Australian Coffee Centre is open seven days a week from 9am to 5pm (Closed Christmas Day). Perched on the apex of the Great Dividing Range around 527 metres above sea level, the Centre is located at the edge of the 360 acre Skybury coffee plantation and is a place where visitors can tour, taste and take home some of the world’s purest Arabica coffee. Skybury Coffee cafe is now open at the Cairns Airport domestic terminal. This is a coffee plantation that has been in the Maloberti family for generations and is still owned and operated by the infamous ‘Bruno’. Here you will take part in a tour where you’ll learn everything from how the coffee grows as a ‘cherry’ to how it ends up in your cup. The coffee is still harvested and dried in the traditional family way. 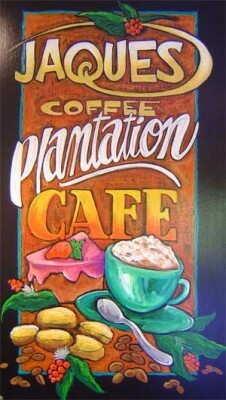 Ground coffee and chocolate covered coffee beans are available for purchase. Across Australia and beyond the Coffee Works brand of Cairns Highlands gourmet products has become synonymous with quality excellence and ultimate value. Established on the Cairns Highlands since 1988 the Coffee Works creates delicious everyday luxuries with you in mind. We invite you to experience the fabulous fermentations of the lychee, mango, jaboticaba, bush cherry, mulberry and passionfruit, at our beautiful de Brueys Boutique Winery, Mareeba. 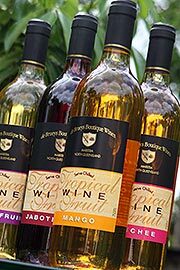 Come and see our orchard, tour the winery, sample our world-class fruit wine, ports and liqueurs and enjoy the relaxing Tablelands. Try the award winning Tropical Temptation or Strawberry Temptation liqueurs. Exotic Flavoured Ice-Cream, Sorbets, Gelato & Frozen Yoghurt. Emerald Creek Ice-Creamery is a locally owned and operated family business located along Kennedy Hwy, east of Mareeba. The refined flavours of the ice-creams and gelato are a result of locally sourced fruits and ingredients, supporting Tableland farmers and Far North Queensland businesses. Quality is the corner-stone of the products. 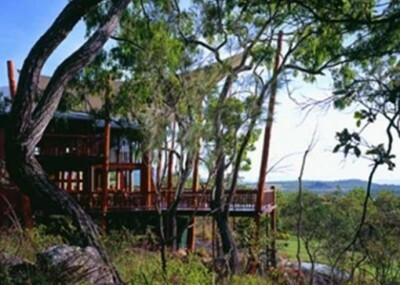 Situated about half way between Mareeba and Kuranda, stop off and refresh with a ‘Mario’s Blend’ coffee. Using 100% North Queensland Tropical Coffee, Mario has got a knack with roasting. Stop for a coffee drinks, and retail sales of roasted coffee products, Nucifora Tea and freshly baked scones, jam & cream. 2nd & 3rd generation coffee growers’ pioneered commercial coffee growing in Australia Producing quality beans roasted and packed in resealable foil. Also produces ‘Essence de Cafe’ and Espresso Liqueur. Stop off to pick up some fruits and vegetables of the area as well as a great variety of preserves and sauces . Look out for the red van on Therwine Street Kuranda, right next to the Kuranda Markets for a refreshing homemade tropical flavoured Ice Cream. 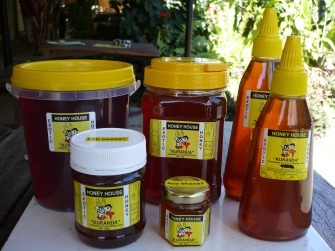 Free honey tasting, live bee display, premium, medicinal and gourmet honeys, fresh honeycomb, beauty products and souvenirs. Situated in the heart of Kuranda, a visit to this candy kitchen will take you back to your childhood where you can watch the candy being made. 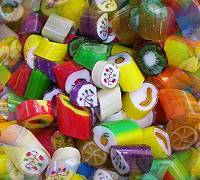 Manufacturer of yummy old fashion Candy, Wedding Candy, and Corporate Candy. 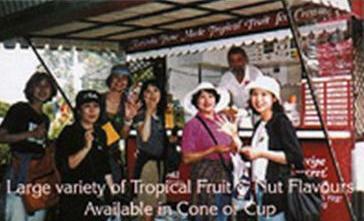 Inside this wonderful nature park tourist attracgtion you can explore a stunning exhibition orchard with over 30 exotic fruit trees. Take time to have a meal in the restaurant serving local produce.